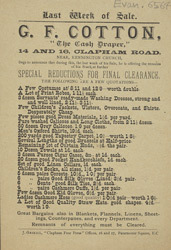 Although opening hours varied from shop to shop, drapers stores, like the one featured on this advert, usually opened at 6am in the morning and did not close until 9pm or 10pm. This was often extended until midnight on Fridays and Saturdays, so that the working classes could shop after they had finished work. By 1870 the Early Closing Association were campaigning for shops to close by 8pm but the working day was still long. Some shop workers were given a mid-day meal break but it had to be taken in a quiet period and there were no tea breaks.